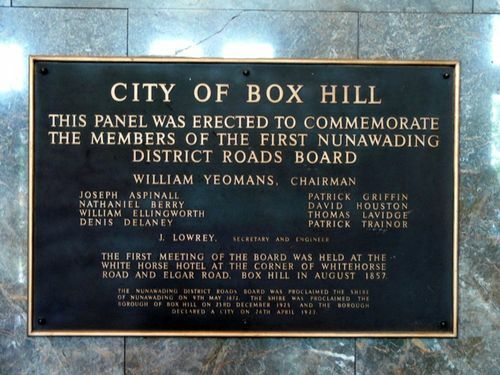 Plaque commemorates the members of the first Nunawading District Roads Board. Road And Elgar Road, Box Hill In August 1857. The Nunawading District Roads Board was proclaimed the SHirte of Nunawading on 9th May 1872. The shire was proclaimed the Borough of Box Hill on 23rd December 1925 and the Borough declared a city on 28th April 1927.